Pumping out the disco groove today, here's a skanking disco number from Kellerkind from the beginning of last year still sounding good. Peppered with bursts of jazz the hypnotic ska-loop beats pull you into the groove, topped off with a funky organ finish, Triple Distilled to perfection. You can't help moving your body to this one. 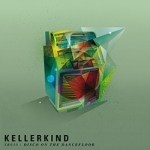 From Kellerkind's Disco On The Dancefloor EP and the album Basement Story. Buy on iTunes click here.